Kiira was first introduced to anime as a kid through shows like Speed Racer and Beyblade, and her interest in Japan culture began with a simple research paper in elementary school. 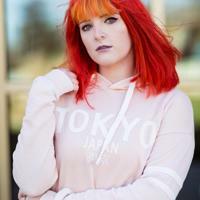 She didn’t connect anime and Japan together until a few years later, and her love for both gave her the opportunity to be a founder of the Japanese Culture and Anime Club at Liberty University, and travel to Japan in 2014 to discover religion and culture. In the future, she plans to move with her husband to Japan in order to support him teaching English and to discover more about the country. Kiira has ran anime and Japanese culture panels since 2012, and has presented them all over the east coast from Ohio to Georgia. She is also a contributor for USAnimeDirect.com, a website dedicated to anime reviews and content. Kiira hopes her panels will not only be fun to attend, but that everyone (including herself) will learn something new.